Is FortuneJack A Site Worth Backing? As one of the more recent Bitcoin gaming sites to appear online, FortuneJack.com has hit the ground running and offers a unique experience when it comes to Bitcoin gaming. Although it does not have have a lot of the normal gaming options that a player might expect, it does have a few and is implementing more, as time goes on. FortuneJack seems to be working its way to becoming rather competitive within the Bitcoin gaming market. For what they are able to provide at the moment, players looking for a new site to play at should give FortuneJack.com a look. “To be completely upfront, FortuneJack is taking its first steps in the cryptocurrency industry. We do not simply take vendor’s games and integrate it into our website. We develop all the games provided on our website, ourselves. All games provided on FortuneJack are produced in-house, therefore, we think by building player’s trust and with a better potential to satisfy player’s needs, we strive to set ourselves apart from other gaming sites dealing with cryptocurrencies. Besides the diverse gaming portfolio, you can find on FortuneJack, we will be adding more slots, blackjack and an instant coin exchange service, within the next few weeks. We truly hope and believe that, along with future implementations, will have a great impact on the cryptocurrency gaming industry, in general. As far as plans for the upcoming months, we are definitely thinking of adding a Sportsbook and Poker room, to try and satisfy players who have been requesting those particular things. Concerning the history and creation of FortuneJack, the FortuneJack brand has been developed by experts with more than 20 years of experience in the gaming industry. Our official partner is eastern Europe’s leading online gaming portal, europe-bet.com, as you can see on the main page of our website. FortuneJack strives to play fair, play nice, and fulfil all the needs that our players desire. The selection of casino games that FortuneJack offers isn’t great in quantity, at this time. They offer Slots, Video Poker, a wheel game, and lastly a dice game. 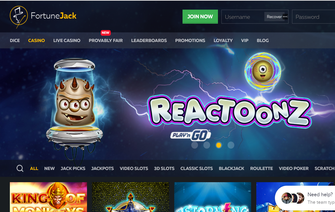 As mentioned in the statement above by the owner FortuneJack, they hope to implement a blackjack game and more slots within the coming weeks, which would definitely persuade a few more player’s interests in FortuneJack. The games they do offer are all set up using a “provably fair” hash confirmation and can be confirmed, instantly, for verification of a win or a loss. All games can be played with every currency that is listed on FortuneJack. Not only can players play with Bitcoin, but they can also play with Dogecoin, Litecoin, Peercoin, and a few others that are a bit less popular, within the cryptocurrency world. They do offer a live version of Roulette and Sic Bo, that are dealt with within the live dealer portion of the site. As far as the live Sic Bo, this is a rarity that isn’t even found at some of the larger casino’s live dealer platforms. For the time being though, FortuneJack severely lacks the necessary requirements of games a Bitcoin casino needs, in order to keep player retention at a high level. FortuneJack does offer Keno and Bingo games, for players of lottery-style games to enjoy. They too use the “provably fair” verification and are comparable to any other Bitcoin gaming site’s, lottery style of games. FortuneJack offers two peculiar ways to wager, that other casinos we have reviewed, do not provide. A binary trading platform, and “Anybet”, a proposition style game that players wager on the probability of future outcomes. For example, players can wager on whether Bitcoin will be a certain price, by a certain date, and be paid out based on the probability of that happening. The higher the odds, the more that will be paid out. Players can submit questions and FortuneJack will provide them 20% of the 1% house edge they take, on the winning sides, if they decide to accept the future proposition. As far as these other games are concerned, they may take a while for the average player to understand and are likely to be removed, once more popular games have been decided to be implemented. FortuneJack boasts and being able to accept more cryptocurrencies than just Bitcoin. They also are able to accept and pay out in Dogecoin, Litecoin, Ethereum, Bitcoin Cash and Zcash for players having more than just one cryptocurrency, in their possession. Depositing is instant, and withdrawals are also instant. FortuneJack offers a 100% welcome bonus (up to 3BTC) on a player’s first deposit, that will need to be wagered 40x over, in order to receive the bonus. Each game offers a certain percentage towards this requirement and is listed on the offer detail page. The other bonus is a loyalty bonus that offers players comps in BTC, the more that they wager and play at FortuneJack. There are four levels to the loyalty program (Bronze, Silver, Gold, Platinum), and each payout a higher level as a player’s reward points are increased. It is a beneficial way for a player to be able to be recognized, for the amount of time and BTC wagered at FortuneJack. FortuneJack has both a live chat and email support for any and all player concerns or problems. The fastest way, of course, is through the live chat, but emails usually take no more than 3 to 4 hours to get a response to. Bonus Just make a deposit and you'll be eligible for a match bonus up to 3BTC!